​Britain’s Supreme Court ruled on Wednesday the government’s benefits cap is lawful, even in cases where it violates childrens' right to adequate clothing, food and other “basic necessities” under international law. Throughout the proceedings, Supreme Court judges criticized the cap for breaching the United Nation’s (UN) Convention on the Rights of the Child. The controversial cap, introduced in 2013, limits the amount of state benefits an out-of-work family can receive to £500 per week. This sum covers housing benefit along with benefits for children. It doesn’t take into account the size of a family or other important circumstances such as the cost of rent. Following a long legal battle, the case was brought to the Supreme Court. The appeal was launched by two single mothers and their young children, who had fled severe domestic abuse and were threatened with the prospect of homelessness as a direct result of the cap. UK charities Shelter, Women’s Aid, and Child Poverty Action Group (CPAG) supported the women and their children throughout the course of the proceedings. Lawyers representing the single mothers argued the benefits cap, introduced by Conservative Secretary of State for Work and Pensions Iain Duncan Smith, adversely affects single parents. They said the policy had a discriminatory and disproportionate impact on women, particularly those attempting to flee abusive partners. The court’s ruling on Wednesday came as a blow to the single mothers and their children. The judgment was issued at 9.45am at the Supreme Court in London’s Parliament Square. Three of the five Supreme Court judges found the government’s benefit cap violates the UN Convention on the Rights of the Child, which stipulates that interests of children are paramount. However, a majority of judges found the policy does not breach Article 14 of the European Convention on Human Rights, which bans discrimination. Because the European Convention is integrated into British law and the UN Convention is not, the families’ appeals were rejected. Following the court ruling, Chief Executive of Child Poverty Action, Alison Garnham, called for the government to comply with international law. “The women and children involved in this case were escaping horrific abuse,” she said. One of the Supreme Court judges, Lady Hale, said in her judgment “saving money cannot be achieved by unjustified discrimination." “The major aim of incentivizing work and changing the benefits culture has little force in the context of lone parents, whatever the age of their children.Depriving them of the basic means of subsistence cannot be a proportionate means of achieving it,”she added. Another Supreme Court judge, Lord Kerr, echoed Lady Hale’s assessment. He said depriving youngsters of “adequate food, clothing, warmth and housing” under this policy in not in the interest of any child. Lord Carnwath, who also presided over the court ruling, said the cap strips children of their benefits on the basis of their parents' circumstances. He urged the government to address this concern during their upcoming review of the policy. 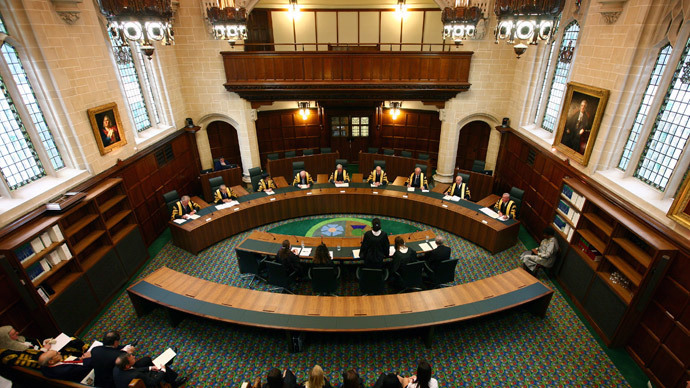 UK charity Women’s Aid, which seeks to assist women who have suffered from domestic violence, said it was disappointed by the Supreme Court’s ruling.It expressed concern that judges had downplayed the difficult circumstances the women central to the case had experienced. “On average 2 women a week in England and Wales are killed by a current or former partner. It is essential that all professionals working with survivors understand the serious nature of domestic violence – especially those within the justice system,” she added. The women who brought the legal challenge against the government wished to remain anonymous because they were fearful their ex-partners might identify them. One is a lone parent with six children. Her youngest child is four years old. She fled from her husband because he allegedly abused her and her oldest daughter. The family is now living in a cramped two-bedroom flat in London, where they are close to their Orthodox Jewish Community. While the mother-of-six found employment for a period, she was unable to sustain the job due to care constraints and family demands. After the government’s benefit cap was introduced, she and her family were left with a mere £80 a week to survive on. They now live in a two-bedroom flat on the outskirts of London. The government’s benefit cap has left the family with a deficit of £50 per week. They can no longer afford their rent.